A DVR (Digital Video Recorder) is a type of cable box that lets you record television programming onto its built-in storage. Once saved, you can watch your recorded shows/movies anytime, with full control to Pause, Rewind, Fast Forward, and even Instant Replay. The playback control features (Pause, Rewind, Fast Forward, Instant Replay) are also available to you while watching live TV, even if you aren't recording it! Take control of your programming and let your shows revolve around your schedule. Using a DVR from GLW Broadband is easy! By simply browsing the program guide you can schedule recordings of your favorite shows, 1 episode at a time, or schedule to record them all (with or without reruns). Using the Live TV playback control features, you can pause what you are watching anytime. Never again will you have to miss a minute of your favorite show if you need to step away from the television. Rewind to watch that great play one more time, or to relisten to what was just said. If you are watching a program that you previously recorded, you can Fast Forward through the parts you don't want to watch and get right to the action! Watch and record a movie, sporting, or special event. Watch them again and again, on your time. Both models of DVR support High-Definition1 programming, so if you have an HD capable TV, all of the DVR features are available on HD programming as well. HD Service is $5/mo. With a DVR you have the option of watching a previously recorded program while recording another. 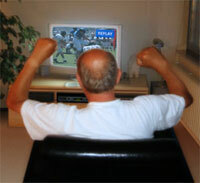 Our Premium DVR will allow you to record 2 shows while watching a previously recorded program. You can learn more about how DVR works at the Demo Page. It's your television, take control today! Call our office for complete details! DVR Service not available in all areas, call our office for details. 1 High Definition service not available in all areas. Call our office at (440) 926-3230 for details.